Forgive the PG-13 language in the title, but it’s the honest truth—here at Remin Media, we’re THAT excited that you’ve made it here. Seriously, it shows that you’d at least consider writing top-notch, industry-leading articles for us. And no worries—if there’s a doubt in your mind as to whether or not writing an article or two is actually worth your time and energy, allow us to get rid of it this very instant. You’re a dental professional—not an SEO specialist. Still, the more favorably Google’s main search algorithm looks upon your practice’s website, the better. This is where guest blogging and the backlinks it provides come into play. When you a write a hard-hitting, opinionated post for Remin, as long as there’s genuine value provided, we’re happy for you to link back to your website. Let the link building begin! There’s a reason public relations (PR) professionals target journalists to help them spread the word about their clients’ companies—they’re greatly influential. They’re authoritative figures. No, you’re not a PR professional, but in 2016, you don’t have to be to get coverage. Thanks to guest blogging, everyone has the opportunity to publish, reach larger, more established audiences (like ours) and make a name for themselves. Writing for a Remin, you do just that. Here at Remin, as long as you educate or entertain our growing body of active readers and “use your juicy voice,” we don’t ask that money change hands. Even better, if you’re a consultant or are looking to break into consultancy, by writing for Remin, you place your name, site link and ideas in front of thousands of potential clients—for FREE. Whether you’ve written a bestseller or get cold sweats at the mere thought of having to write something by yourself, we promise that Remin is a “safe place” for your writing. Remin Media is offering some sweet prizes for the best piece of content this month, apply now! We’ll work with you, helping you craft something truly brilliant! We are also upping the ante a bit this month offering some sweet prizes (and bragging rights) to the best piece of content we receive before the end of the month. Have questions? Need help? Contact our Editor directly HERE. 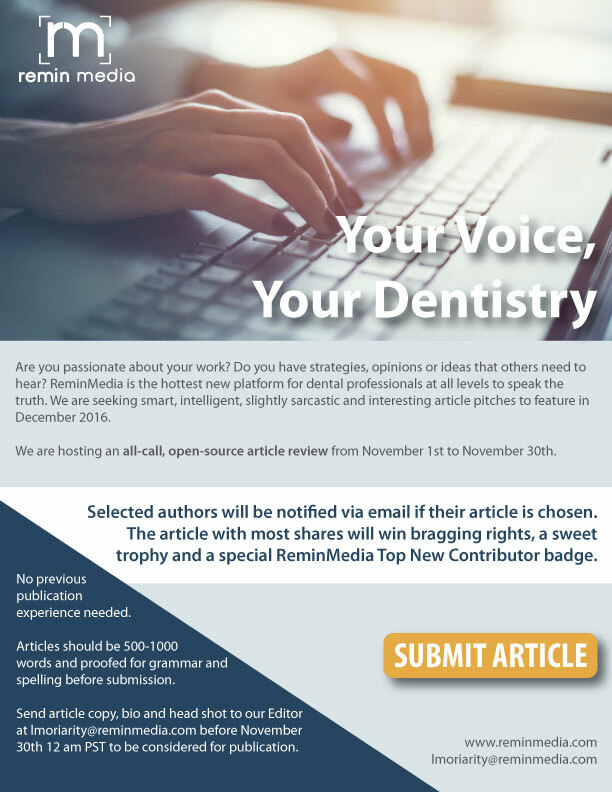 Want to Improve Your Authority-Based Dental Marketing? Think Locally.